There’s a movement gaining ground in London at the moment. As Byron Hamburger spreads across the capital with breakneck speed (and eventually capsizing aging Hamburger Unions and weary GBKs in its wake), the joy of finding a decent hamburger in the capital is becoming less of a rarity. I’m a big fan of Byron. They’re mainstreaming and quality-controlling the expansion of a decent burger experience. This is something London is not used to. At the opposite end of the scale, away from the building sites and the neatly printed menus and expensive agency branding, you’ll find The Meatwagon. Behind a large van in a very typical Zone 2 industrial estate a few minutes walk from Peckham Rye station, sits an unbranded, unassuming little food van. This is the celebrated Meatwagon. I first came across the ‘wagon from a similarly burger-afflicted friend who pointed me in the direction of their Twitter account. It said they weren’t going to be around for a few weeks. Harrumph. And then, on a Wednesday afternoon, an update. It’s back. Thursday and Friday. From 12pm ‘until we run out’. Ominous. Tempting. Only nine minutes on the train from London Bridge. A flurry of instant messages between me and another burger critic, and we’re set for Friday. After stumbling through some leafy Peckham side streets, getting a bit lost, and a quick ‘that can’t be it’ double-take, we’re standing before a beaming Yianni, who gleefully tells us he can do a cheeseburger, bacon cheeseburger or chilli burger. With chips. Triple-cooked. Obvs. I think the pictures do these justice, but there’s a few points to make here. Yianni uses 100% chuck which he pulls out of a little fridge in big fistfuls and bashes them into patties in front of you. Salt and pepper. The bacon is interesting. 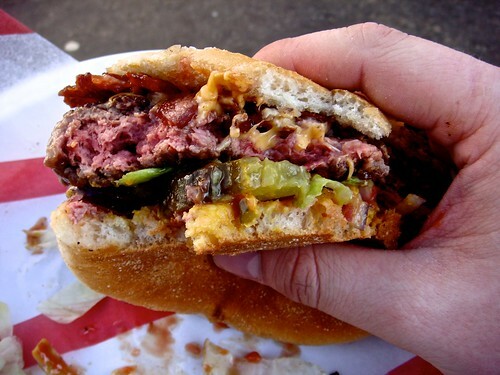 He boils up a side of bacon, shreds some off and bashes that into a patty too. It’s thick and chewy, like American crispy bacon without the fat, chemicals and over-saltiness. As for the chilli, it’s half a green chilli fried in butter with a touch of stock. Genius. Both are thrown on top of the patty on the grilling plate before the piece de resistance goes on last. The cheese. Two slices of it come out of the fridge. It looks like Kraft. We ask if it is Kraft, like a pair of over-excited children. Yianni smiles and says “No, it’s real cheese. It’s taken me ages to source this and it’s my secret. I’ll happily tell you about the rest of the process, but the cheese is my secret weapon”. We don’t push. The buns are locally sourced white sourdough. Soft. Unseeded. Exceptional. Yianni carefully lattices mustard and ketchup on each side so they have a perfect covering. And when we get to eating it, the fact we’re standing next to a bin in a glorified car park in Peckham just melts away. The meat is juicy, flawlessly pink and perfectly seasoned. The cheese which has since melted into the patty renders us speechless and is as close as you’ll ever get to a west coast In’n’Out-alike. The meat-to-bun-to-condiment ratio is perfect. We are ecstatic. 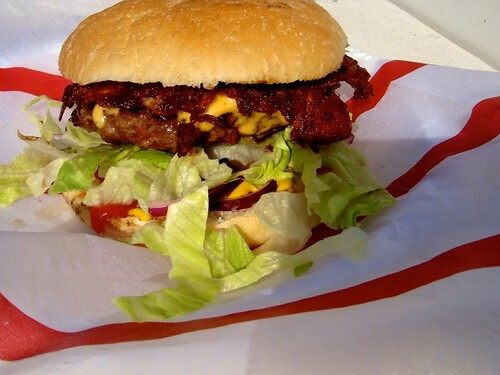 If you’ve got anything more than a passing interest in quality burgers, then follow the Meatwagon. Yianni said he’ll be back in a few weeks time. The Meatwagon is his part-time dalliance when he’s not doing proper catering jobs. Get down there. It’s an adventure and it’s London’s best burger. It’s a damn sight better, and 100% more Guerilla, than that other place. Follow the Meatwagon on Twitter and Facebook.